The American Heart Association’s Start! initiative calls on all Americans and their employers to create a culture of physical activity and health to live longer, heart-healthy lives through walking. It offers resources for employers to implement a walking program in the workplace and track employees’ progress in the program. One of Start’s key components, National Start! 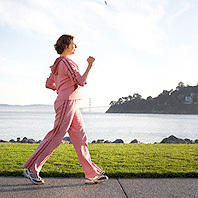 Walking Day aims to get Americans up and moving for 30 minutes on April 8, 2009. National Start! Walking Day will take place during National Workplace Wellness Week. Step 1: Remember that your safety is the most important thing! If you’re a male over 40 or a female over 50, you may want to work with your doctor to set up your exercise program. Remember that physical activity can be accumulated throughout the day. Three 10-minute sessions is the same as one 30-minute session! You can also download this chart from the American College of Sports Medicine and Center for Disease Control and Prevention, which lists physical activities by their level of intensity. Happy trails!